Virupa Visual Solutions, one of the major Dutch sign companies and experts in the field of in and outdoor advertising, experienced significant growth in the last twenty years. Keeping up the level of turnover, however, was taking up increasingly more energy. The root cause were the business processes, which had been compartmentalized into function-based departments. This resulted in increasingly more work in progress, backlogs and rush orders to 'fight fires'. That way other orders were slowed down, and new 'fires' developed! In QRM jargon this is called the Response Time Spiral. To break this, Virupa disbanded the office departments and replaced them with four Quick Response Office Cells (QROCs). In each QROC a multidisciplinary team deals with all the processes and administration for a specific group of customers. In fact, this is how Virupa worked in their early days, because it looks as if the office is divided into mini offices. 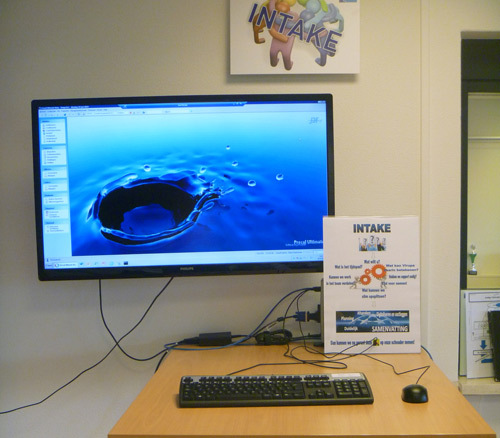 New is however the introduction of performance-based assessment and visual management. This is the basis of a large degree of self-management in the QROC's. In addition, Virupa has come up with a QRM innovation: a QROC containing a flexible pool of workers. Production people in this pool temporarily help out when new orders in the office reach a peak. When this peak is under control, they move back to their normal work. Virupa Visual Solutions offers sign solutions, i.e. all visual expressions in shops ranging from billboards to vehicle graphics and from price signs to digital displays. 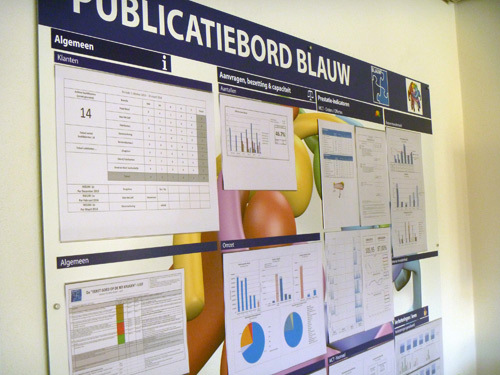 'Fixed formula customers, such as do-it-yourself stores and retail chains, are supplied with a complete package of visual signs for their stores,' explains Jos Migo, project manager and QRM coach at Virupa in Aalten. After a company visit to Bosch Scharnieren, the first Dutch company to start with Quick Response Manufacturing (QRM), Virupa felt good about this improvement method. 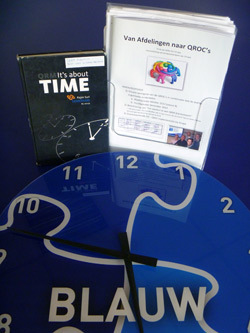 The enthusiasm increased further after having participated in a master class at the Applied University Arnhem & Nijmegen (HAN), given by Rajan Suri, the inventor of QRM. Virupa returned to the time when there were no boundaries between departments. To that end, mini offices were formed, so-called Quick Response Office Cells (QROC's). New is the implementation of performance measurement and visual management. On this photo the publication board of a QROC. At that moment, Virupa was not yet measuring lead times. However, all groups estimated that the touch time, i.e. the percentage of grey time, was only around 3%. All the rest was white time. In other words: waiting time. The most substantial delays occurred during administrative tasks. Because the office processes were the source of most delays, improving those processes got priority. Mini companies in the office, established with QRM, are called Quick Response Office Cells or QROCs. A QROC consists of a small and dedicated team, which has competences to deal with all office processes for one specific market segment. QROCs have a large degree of self-management, be it within specific boundaries. Each team is jointly responsible. As a result, conflicting interests are history, and everything goes much faster. Supporting tasks which are generic in nature, such as invoicing, are often not included in the QROCs. The transfer of orders between the accountmanager and the QROC-team, which deals with all the administrative tasks until the order is released for production or delivery from stock, takes place at this intake table. An organisation representation meeting is a kind of role play in which staff and/or departments are represented by (hired) outsiders. These persons can express their feelings freely. The question arises however, how important their meaning is, because these people don't know anything about the company. The clue is, that the customer (here Virupa) positions the representatives in the room. The hypothesis is that the results you get with these positions are universal. 'It may seem astonishing, but it really worked! One of the people played the role of Jan Nales, our new Commercial Director. He entered our company with a lot of knowledge on process improvement from Unilever and Grolsch. However, this raised doubts in the QROC. These doubts increased when Elwin Bullée, our Operational Director who had introduced QRM, litterally distanced himself from the QROC. At some point he literally stood on the threshold of the room. That made it logical that the people in the QROC started to make remarks like "after this, I'll simply go back to my own department". The four QROC's with the customer teams and the QROC with the standard tasks team (in green). The account managers of the sales team (in Dutch 'verkoopteam') deal with customer relations. The above diagram shows Virupa's way of working since March 2014. All office departments disappeared, and were replaced by four QROCs. The working processes in the warehouse and on the production floor have remained the same. One special QROC has been established however, the Standard Tasks Team. This team can provide assistance in carrying out simple office tasks, for which no specific customer knowledge is required. 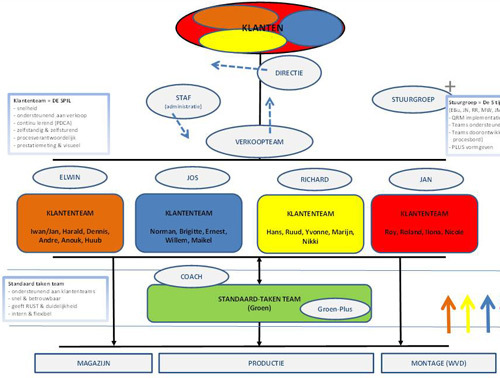 The Standard Tasks Team for example handles orders that come in as an EDI message. 'Previously, those EDI orders sometimes remained unaddressed because fire fighting absorbed all our resources. Customers did not understand that, because they don't expect a strong variation in lead times. 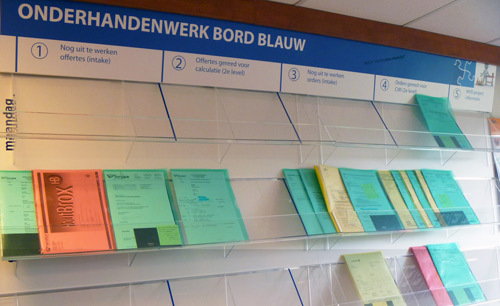 Since the Standard Tasks Team took up its activities, all EDI orders are processed within 4 hours'. Visual Management is very important in a QROC. In a single glance it is clear what the status of specific orders is. Orders in red maps require a lot of work. When asked for tips for other companies that want to introduce QROCs, Migo emphasizes the importance of visual management. 'As soon as you visit a QROC, it should be clear in a single glance if there are problems or not. For instance, we put orders in a red map if these require a lot of work, otherwise they are put in a green one. During processing, the maps move from the left to the right. Additionally, each QROC has a publication board with the actual lead times and other performance indicators. Because sign products are our specialty, we could shape our QROCs attractively. For instance, there is a sign with all customer names on the door.